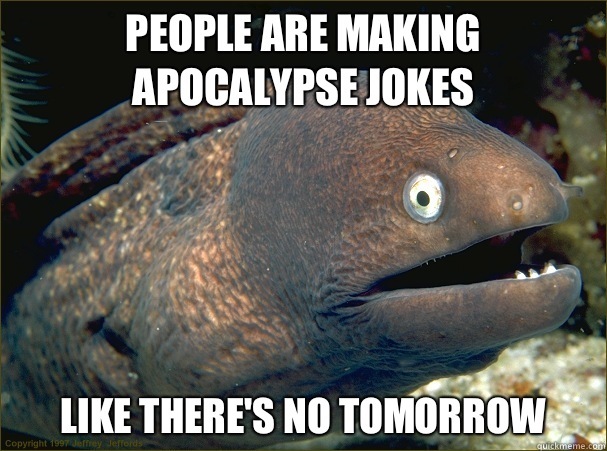 What Do Apocalypse Preachers Do When the World Doesn't End? It has to be pretty crushing when your big hellfire prediction fails to materialize. We should all count ourselves lucky. This century alone we've already survived at least 20 raptures, with our latest narrow escape coming just over a month ago. On October 7, the world was supposed to have been consumed by flames, the majority of the global population burnt to cinders, what with God being notoriously picky when it comes to dishing out his golden tickets. This cheery PSA was delivered by Chris McCann, leader of the Philadelphia-based religious group eBible Fellowship, who told the Guardian: "According to what the Bible is presenting, it does appear that the seventh of October will be the day that God has spoken of: in which the world will pass away." Sure enough, the seventh rolled around and there were no all-engulfing flames. No ghostly horsemen plucking bad souls from their commutes and dropping them into Hell. Just a reminder that pregnant women should avoid alcohol and the announcement of this year's Bake Off winner. To most, these failed doomsday predictions are just Twitter fodder—thousands of people making the same joke, then forgetting all about it, and just getting on with their lives. But for those who genuinely thought they'd said their last goodbye to their closest loved ones, before finding they've once again been denied entry to the pearly gates, it surely can't be such an easy thing to forget. So what actually happens to these believers? How can they continue to believe in the aftermath of a very publicly failed prophecy? The rapture, like any good party, requires a lot of preparation. First, there must be the handing out of the invitations. In 2011, for instance, End Times preacher Harold Camping used his radio station, Family Radio, to spread the word of the impending doomsday on May 21 that year—a date he then revised to October 21 when the hellfire failed to materialize. Then, depending on your preacher, there might be a practice run. David Berg, founder of the religious movement Children of God (later rebranded The Family International after a series of controversies and allegations of child abuse within the sect), took a more hands-on approaching to getting his followers prepped for the various apocalyptic events he had predicted. Flor Edwards grew up as part of the CoG in the 1980s and 90s, so I emailed her not long after McCann's failed prediction to ask her more about life before and after a failed prophecy. She told me that, in preparation for the end of days, men from the camp where she lived would storm her dorm unexpectedly as she slept. "The Rapture would be preceded by the Great Tribulation, or 'The Last Days.' The men coming in were part of the Antichrist's army, I think," she said, explaining that the people running into her room with guns and batons were mimicking this supposed military force. I suggested that it must have been terrifying to face the prospect of an early death from such a young age. "Of course it was terrifying," she said. "We thought we'd be saved, but the threshold to get there would be death, and perhaps we would have to meet our fate as martyrs. By the time [1993, the year of the supposed apocalypse] came, I was a young preteen living in America. I was no longer scared of death." Once that's been cleared up, out comes the damage control. Admitting outright failure threatens a group's ability to continue, so many prophets will just move the rapture date along a bit, making sure to keep it vague. According to Flor, after 1993 passed without a single doomsday, Children of God founder David Berg began distributing newsletters to followers entitled, somewhat ambiguously, "It Could Happen This Year." Was this was the start of the group's unravelling? I asked Flor. "This was definitely the 'unravelling of the group,'" she said. "There was almost a sense of humiliation that the predictions 'the prophet' was making were not coming to pass. That was the hardest pill to swallow for most of his followers." When this kind of thing happens, some, like Flor and her family, will leave. After 1993, Berg had insisted they move back to America from Thailand, where they were living at the time, to continue evangelizing. But they felt jaded, and in 1996 Flor. "You have to understand that Father David didn't dump these ideas on followers from the beginning," she told me. "It started as a very innocent, hippie love-shack kind of movement. Young people looking to make the world a better place and create change." But for those who decide to leave, there are always more who stay. Believers don't lose faith easily. Like Abraham, many followers believe they're being tested by God, so every failure is an opportunity to demonstrate their loyalty. So they carry on: they campaign, proselytize and pray harder than before. There will always be a new rapture date, because if there is nothing to look forward to then the group will fall apart. This glimmer of hope, no matter how vague, allows prophets to continue their work without eliciting too much pressure. Look at Camping: He somehow predicted six failed doomsdays without being hailed a fraud, and even after his death Family Radio lives on. Chris McCann himself is a follower of Camping's teachings. His eBible Fellowship—which he has pointed out is an online organization, not an actual church (though it does hold monthly meetings)—has also managed to retain large numbers of its followers after its October 7 mis-prediction. The eBible Fellowship declined to speak to me for this article, emailing me the following response when I asked them what they do when the world fails to end: "I'm afraid we would be too boring for your story. We simply return to the word of God, the Bible, and keep studying it. That's it." However, their site, oct7thlastday.com, states: "E Bible Fellowship [sic] was incorrect regarding the specific day of [the world's] end, but we were not incorrect that it will one day soon come to an end... [The world] tends to view a 'passed date' for its end as some sort of victory and celebrates it as though it means it will never end. And yet, the truth is that the world is in its death throes... It's just a matter of when that remains in question." At the time of writing, predicting the world's end has a perfect failure rate of 100 percent. But as Lorenzo DiTommaso, a Professor of Religion at Concordia University, tells me, it isn't as simple as followers of these End Times preachers just seeing the light. "Like any deeply held worldview, a person's theological worldview is an expression of one's core views," he said. "Persons usually don't choose or change belief systems like they're buying fruit at the market." Religion and a person's relationship to it is complex and resilient, and so doomsdays will continue to be set and believed. And while it's easy to dismiss those who believe so fervently, even in the face of such strong social antagonism, there aren't many of us who can put our hands up and say that we haven't once done something vaguely similar. Everyone has believed something absurd; I once spent $27 on a batch of Kony 2012 posters in the belief that it would somehow impact the ethical decisions of Ugandan guerrilla armies. Embarrassing in the aftermath, yes, but I survived. And despite the predictions of these doomsday prophets, it looks like their followers will, too. Follow Pascale Day on Twitter.